SCT1258 series are replacement of JST GH connectors. 1.25mm pitch with secure locking device. Low insertion force type realizes easier mating opearation for small electronic device. The GH 1.25 mm Pitch connector is a low profile connector designed for Plasma Display Panels (PDP’s), Liquid Crystal Displays (LCD’s) or other small sized equipment. Like the SH series, the GH 1.0 mm pitch connectors are also heavily used in small racing drones. Engineered to be space efficient which provides significant PCB savings, Scondar manufactures different models, in different dimensions, with top or side entry configurations. Top entry configuration only consumes a height of 7.3 mm and depth of 4.25 mm. Whereas, Side entry configuration consumes a height of 7.15 mm and a depth of 4.35 mm. In addition to the above flexibility in configurations of the 1.25mm pitch connector, Scondar also offers this connector with different number of circuits ranging from 2 to 20 circuits which would suit your specific need. No alloy was used in fastening the wires to the board, but through the use a crimping method, which makes it more flexible and mechanically stronger. The crimps are well engineered to be air-tight, preventing oxygen and moisture from reaching the metals, causing corrosion. Thus, the connector can be easily removed from the head without holding the wires. Furthermore, it prevents the cables from being easily disconnected due to entangled routing or heavy loads. The GH 1.25mm connector has compatible features with SHL connector, so in the absence of an SHL connector, the GH 1.25mm can be utilized as a replacement. 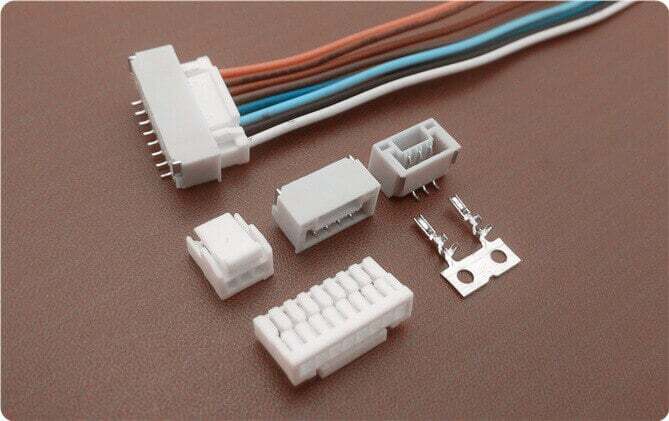 The temperature range for the 1.0 mm connector is -25 degrees centigrade to +85 degrees centigrade. This range is based on the rise of temperature with increasing current. Insulation resistance and contact resistance are of 100 Megaohms per minute minimum and 50 mega ohms maximum, respectively. The connector can be used with the wires of AWG within the range of #26 to #30. This applies to wire diameters 0.2mm to 0.4mm. It can be used in all types of PCB assemblies, projector, and high power applications, computers, inkjet, notebook PC, ATM machines, LCD, security systems, digital camera, cell phones, scanner, medical equipment, fingerprint machines, taximeter, automobile, power source for communication devices and many more. Driving requires not only the physical coordination of your hands and thought, but also high-quality automotive parts which are fine-tuned and in good condition. The combination switch is one thing because it allows you to turn the headlights on and off, maneuver the headlight beam function and turn signal lights on.